Valentine’s Day is a month away, meaning that Pinterest and Craftgawker and a thousand other online craft venues are drowning in it. As I’ve discussed before, I have a weirdly antagonistic attitude towards Valentine’s Day. At Easter I will gladly coo over sweet baby things, at Christmas I’ll happily haz all the feelings over seasonal cards & darling handmade ornaments. But on Valentine’s Day all the red and pink and hearts hearts HEARTS give me a bad case of the gags. The other holidays feel genuine in their gooeyness, but Valentine’s Day has a contrived saccharine quality, like it’s been soaked, dipped and coated in corn syrup. Which it pretty much literally has. Perhaps this is because Valentine’s Day tells us not just to express our love, but exactly how to express it, and when and to whom. And most of us love a lot of other things besides teddy bears & heart shaped chocolates & last-minute because-I-have-to-or-she’ll-kill-me flowers. Like books. And video games. And craft supplies, classic movies, superhero socks, fuzzy sweaters, dance music, pistachios, going to the store, feeding the ducks at the pond, catching fireflies, chicken salad sandwiches. If your darling does like flowers, there are a lot of alternatives to the last-minute corner store variety. 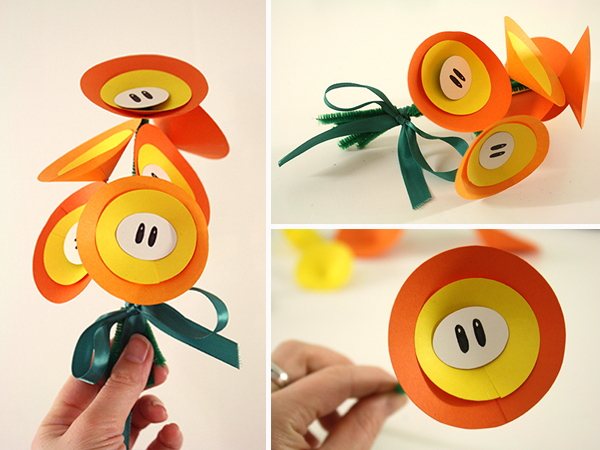 So this week I’ll show you how to make a very easy paper posy of Fire Flowers, a charming handmade gesture of affection for the Mario-lover in your life. Before we start the tutorial, I present a few other Valentine’s Day ideas that are not teddy bears and chocolates. Or roses. Roses? Hah, how dull and traditional! 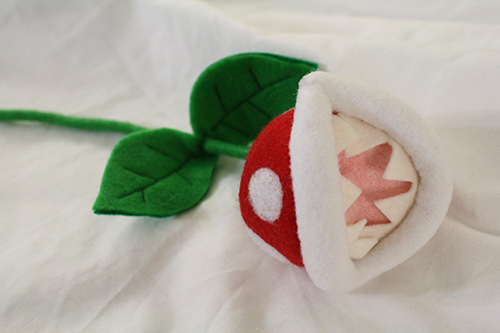 How about a long-stem Piranha Plant instead. Added bonus: it will not fade or wilt, though it may nibble unwary fingers. 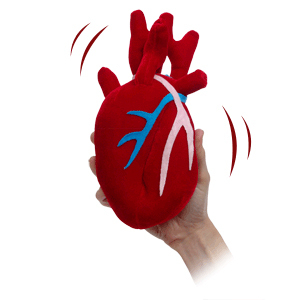 Or if you’re more into science and anatomy than botany, why not a nice soft, cuddly plush heart? And for the neck-squeezing, cephalopod-inclined, a tentacle neck pillow! 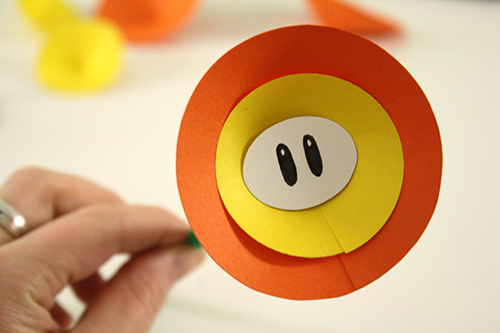 1) Start by printing out the Fire Flowers template and cutting out the pieces. 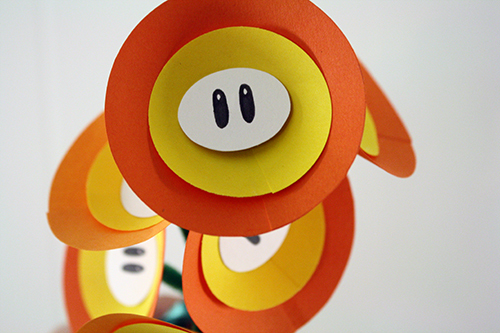 Then, for each Fire Flower you wish to make, cut one small oval from white paper, one medium circle from yellow paper and one large circle from orange paper. 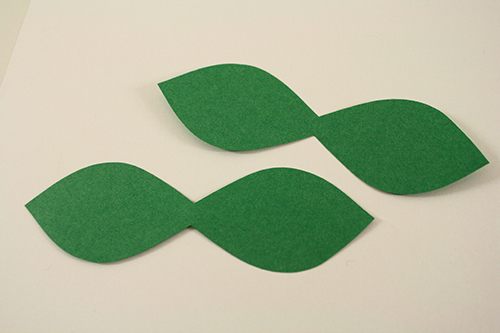 For leaves, cut 2 sets of leaf shapes from green paper. Leaves are optional, and more recommended if you’re making just one or a few flowers, since in a large bouquet it may be hard to fit them all in. Or you could do half of your bouquet flowers with leaves and half without. 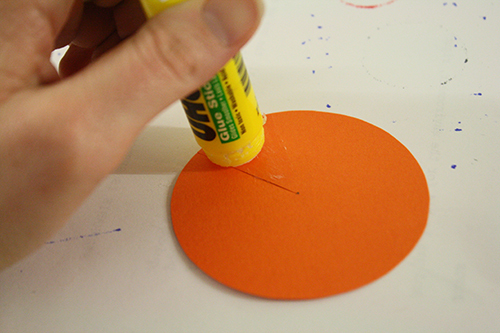 2) Use your pencil to make a small dot in the approximate center of each yellow and orange circle. Just make a guess at the center – this doesn’t have to be perfect. Then cut a straight line from the edge of each circle to the dot in its middle. 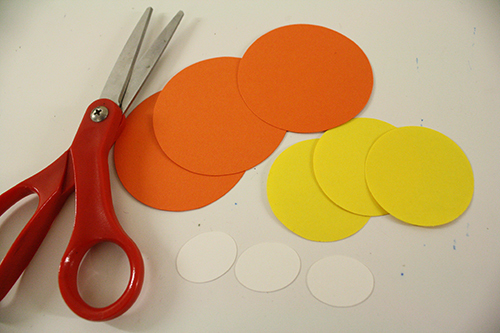 3) Next, one at a time for each circle, apply glue along one side of the cut. 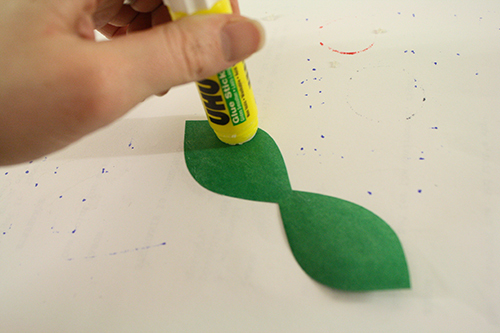 Apply the glue in a triangle shape, with the point of the triangle at the center of the circle. 4) Fold this glued area underneath the rest of the circle, forming a shallow cone. Press firmly in place, and maybe use a binder clip or clothespeg to hold the paper while the glue dries. Repeat for each yellow and orange circle. 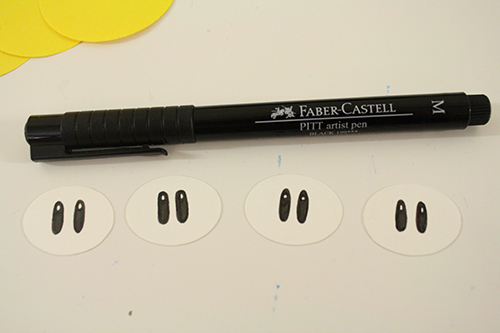 5) While those paper cones are drying, use your black marker to draw long narrow eyes onto each of the small white ovals. If you want, leave a small space at the top blank, for a white dot on each eye to imitate the effect of light reflected in the eyes. 6) Now take a pipe cleaner (you can cut them into 2 or 3 pieces for shorter stems if you like, and I recommend making stems of varying lengths) and bend the very top 1/4 inch of it at a 90 degree angle. Then apply strong glue to the top of this bent portion. OR skip this gluing business and cut yourself a small piece of scotch tape instead. 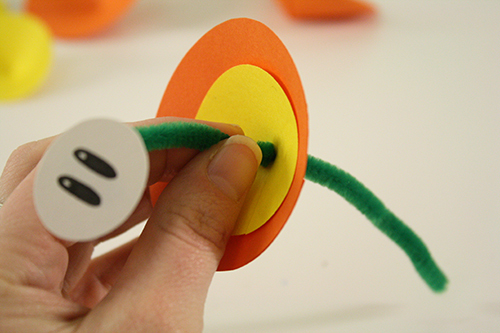 7) Stick this end of the pipe cleaner to the back of one of your white ovals with eyes. Affix it so that the long part of the pipe cleaner descends from the center back of the white oval. Let it dry well. OR just a small piece of tape to secure the bent portion of the pipe cleaner to the back of the oval. 8) Once your paper cones are dry, stack a yellow cone inside an orange cone and use a large needle to make a hole through their centers. Repeat for each set of yellow and orange cones. 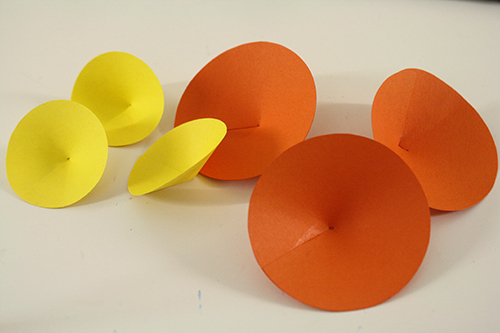 9) Once glue attaching the pipe cleaners and white ovals is dry, stick the end of a pipe cleaner through the hole in one of the yellow and orange cone sets, and pull until the white oval rests right in the middle of the cones. 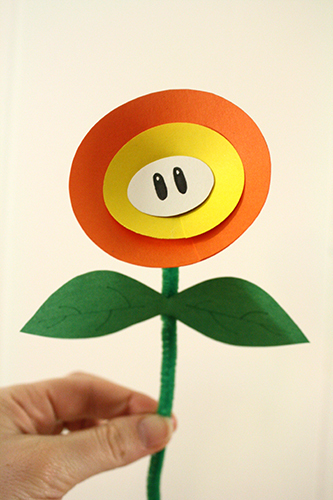 Voila, you have a Fire Flower! 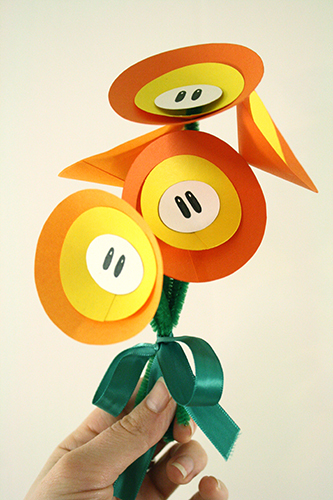 10) If you want to add leaves, you’ll need two sets cut for each flower. Take one set and cover it in glue. 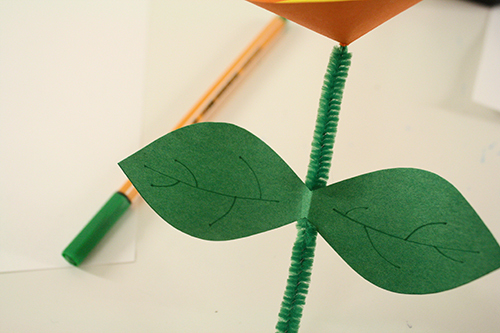 Then place it behind the stem of the flower, place the second set of leaves on top of it matching them up exactly, and press them together. If you like, use a green pen to draw some lines on each leaf. 11) Now present your lovely posy, possibly along with some delightfully cheesy message to the effect of “You set my heart on fire!” or “May the fire of our love never die!” or something equally awful. What is the best thing you’ve ever done (or that someone else has done for you) for Valentine’s Day? next shot, in most cases you’ve just shot yourself in the foot. photos online, and can even be set to automatically backup new photos.